Mind mapping is still going strong in Ms. Cavanaugh and Ms. J’s classes! Below is more of the progress made on these maps during week 2. Everyone is really looking forward to seeing these in their completed forms! Sara also met with students in Chad Stauber Soik’s Humanities class to help brainstorm ideas for the art component of their current essays which include topics such as religion, hope, and technology. Drawing, photography, and other visual mediums were discussed to figure out how to best present each student’s concept. In the studio, there are collages and drawings everywhere! Sara has been busy creating pieces for her upcoming two-person show, In Tandem, opening in May at the Frank Juarez Gallery. The Art Foundations 2 and Senior Art 2 students were introduced to the world of printmaking. The focus of this project was to select someone that he/she looks up to and to share why he/she looks up to that person. Throughout the school year art students were exposed to various projects focusing on positive and negative space, which allowed them to be successful in this project. Although there were some minor technical issues, overall, they turned great. What does your mask say about you? Works by Advanced 3D Design Students. Way to the north, where the darkness resided, was a kingdom. The kingdom had been abandoned for many years. There were rumors of a knight who guarded the castle of the kingdom, though no one has ever seen and lived to tell the story. The kingdom was not always shrouded in darkness though. The kingdom of the north used to be a great and powerful nation that stretched to the farthest mountains and forests and were feared by all the other nations. One day, a catastrophe happened that left the kingdom never the same again. The kingdom to the north, led by the great king Seed, was the strongest nation of all the nations. The controlled a massive army, large enough to conquer the world. The kingdom had a brave and victorious knight. The knight went by the name of Lionheart. The knight was the most elite soldier of the kingdom. No one would dare step into his territory and because of him, the kingdom was able to keep their high status. One day, sorrow filled the kingdom, as the death of king Seed came to be. The kingdom was then weakened and it was the perfect time to strike. The Prime minister of the kingdom, always in the king’s shadow, grew a hatred for humans. During the time of mourning, a tyrannical beast had attacked the kingdom. It was up to Lionheart to defend it. He ventured forth toward the beast, but was instantly captured upon arrival. He had fallen into a trap! The evil prime minister had invited enemy nations to come take the kingdom. The knight was powerless to the huge force. Unfortunately, the victorious knight had met his match. The citizens of the kingdom watched helpless as he was struck down. Their one and only hope of the kingdom was now dead. With the knight dead, the prime minister had become the ruler of the kingdom, who had turned out to be a wizard. With his hatred of humans, he opened a portal and led evil spirits into the world. Everyone in the kingdom became possessed. One spirit, entered the dead body of Lionheart. The knight had risen up, to see life again. Lionheart was special. With his bravery and courage, he was able to suppress the evil within him and keep his senses. Everyone around him had manifested in darkness. He couldn’t stand the sight of his fellow citizens being controlled by such an evil force. The only thing he could do was strike down the evil wizard who brought the evil spirits upon the world. Lionheart entered the dark castle. It was very different from the last time he had seen it. It was not lit up anymore. The walls were cold and black. He had approached the wizard. Raged and evil filled his eyes. He was clearly letting the spirit in him take over. He swung his two swords, Excalibur and and Caliburn at the wizard. The wizard, being clumsy as he is, was slashed in two. With the wizard gone, the portal closed and all the spirits vanished. Not only did the evil spirits vanish, but also the soul of the citizens. The Kingdom became quiet that day. Only the undead knight survived. He became a soulless soldier, protecting the castle and his dead princess from outsiders. 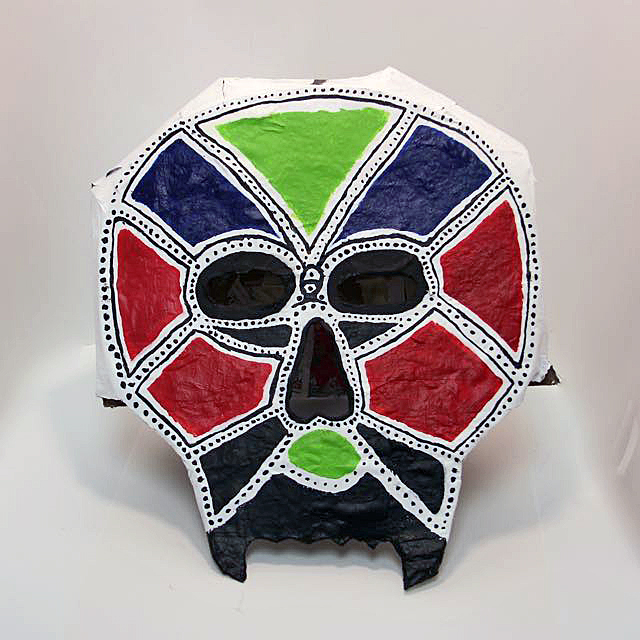 For centuries mexicans all over the world told the story of Bricias Mask. A white mask with the mexican flag, music notes and roses. 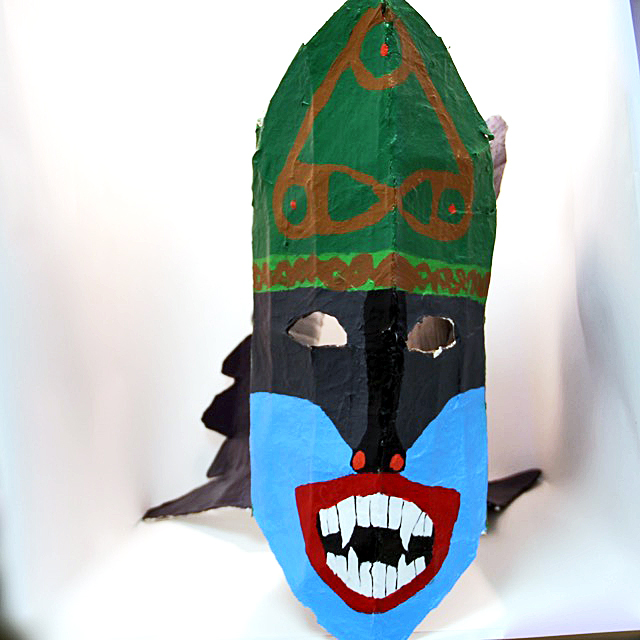 The tale of Bricias Mask started centuries ago when a little girl named Bricia did a courageous and selfless act. This tale reminds mexicans of the power and courage of their people due to one little girl. Deep in the dark Ebony forest there was a kingdom ruled by the Great Chenche. The Great Chenche was a tall and loud man. The Great Chenche ruled the Amoxtli Kingdom known for its strong army. He lived with his eight year old daughter Bricia, a brave and intelligent little girl just below Zempoala. On a sunny afternoon when the sky was an azure the people of the Amoxtli Kingdom was attacked by their enemy, the Ignacio Kingdom. The Ignacio Kingdom, ruled by Ignacio the sixth, attacked the Amoxtli Kingdom. Their feud started many years ago when both Kingdoms tried to take land that was good for growing crops. The ruler of the Amoxtli Kingdom at that time, Acalan and the ruler of the Ignacio kingdom, Ignacio, wanted to expand their kingdoms. Neither one wanted to give up the land. The feud between both kingdoms continued. The blood of thousands was shed. The color of cherry red blood ran across the soil. Corpses laid on the ground and the sky filled with clouds. Many of the older people of the Amoxtli Kingdom fought for their to kill their enemy. The Amoxtli people charged at their enemy with spears, clubs and slings.Bricia stood outside of her stone house and watched as her people fought and died. There was no terror in her eyes but hope. Hope that her father’s kingdom would win the battle. Bricias coal black hair moved with the wind while she ran to her room. She reached for her white mask that had roses and an eagle on the back and music notes on the front . 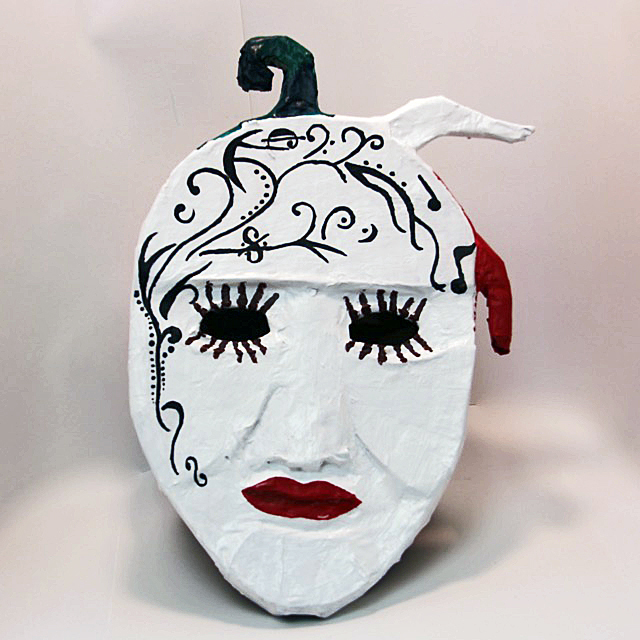 The mask was given to her by her mother before her untimely death. Bricia darted to the battlefield where she put on her mask. Bricia fought for her kingdom, her father, her mother, and for her pride. In that moment on the battlefield Bricias blood splattered across the back of her mask. Bricia will forever be remember for giving her life for her people.An Aztec princesses gave her life for her people and that is something that is remembered. 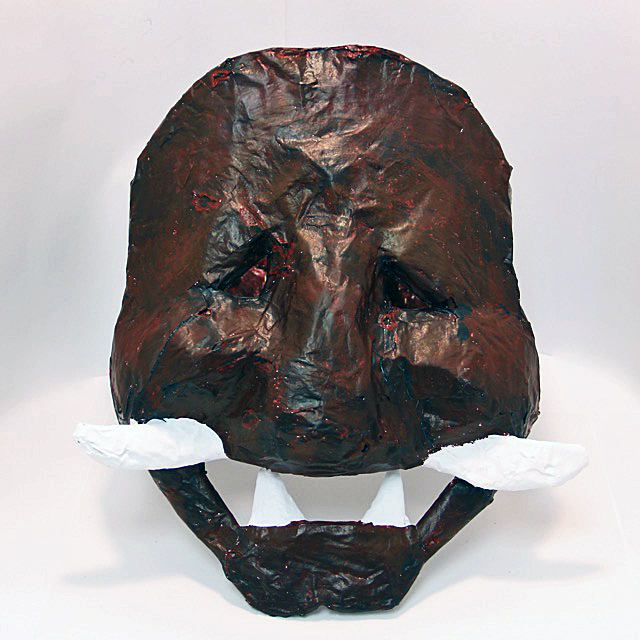 The Great Chenche recovered his daughter’s mask to show the people of the Amoxtli Kingdom that a lot of blood was dispersed throughout the land. The mask that Bricia left behind was kept near her home where she died so many could remember her brave act. The Great Chenche painted green on the mask so the Amoxtli people would remember what Bricia fought for and what she believed in. The red represents the blood of the heroes who lost their lives in the battle. The white represents the peace and harmony that needs to be fought for. The green represents the hope Bricia had in herself and in her people. The music notes on the mask represent her love for music. The roses represent her mother’s presence. Bricia is an Aztec princesses that didn’t give up in what she believed in. She gave her life for her people. In a village in the mountains, there was a tribe of Native American warriors called the Aniyunwiya. The Aniyunwiya were known to be fierce warriors. It was custom of the the warriors to be only men, however there was once very special female warrior. Amadahy was the daughter of the tribes chief. On her 18th birthday her father gave her a precious helmet for her to use in battle. 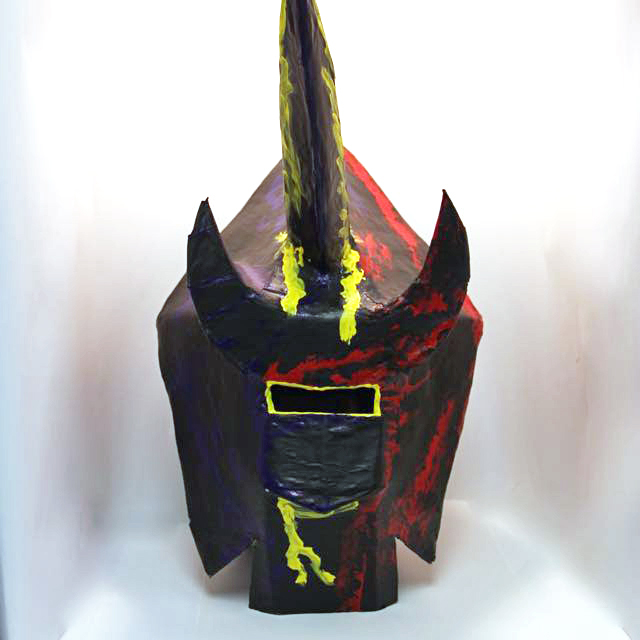 The helmet was painted with a beautiful sun design made up of many colors. One day a neighboring tribe attacked the Aniyunwiya people and a huge battle broke out. The chief was captured and about to be killed unless Amadahy handed over her helmet. Amadahy loved her father to much to allow him to be killed over the helmet. So she handed over her precious helmet and the enemies went away. Amadahy and her father lived happily ever after. 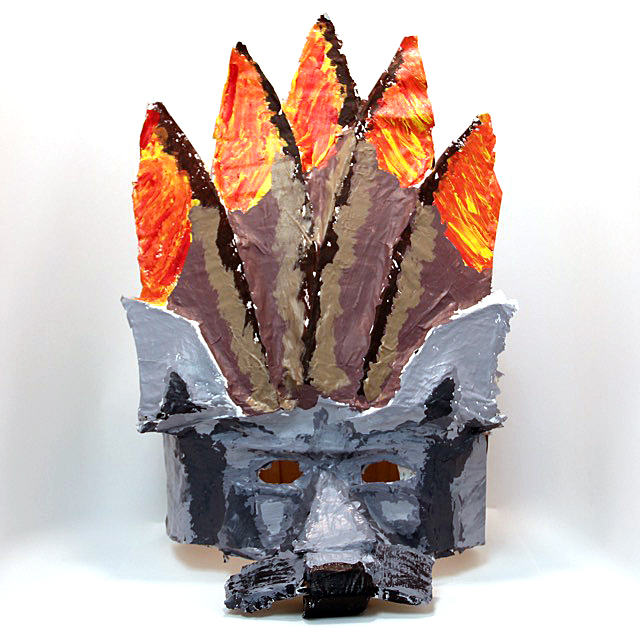 Being a person who liked to be different, he combined his headdress and the mask into a great blend of both. Since then he has worn it to all battle and passed it on to his son who continued the tradition. 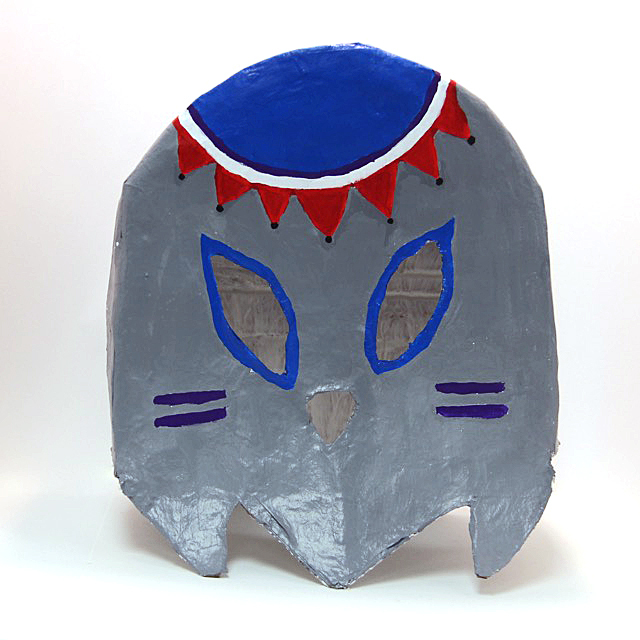 Legend is foretold, there is a mask that gives its wielder immense power. Many men fought for this mask. But, it was lost to humanity amongst the war over it. But, it is said that the mask will appear to those who have nothing left for them in the world. 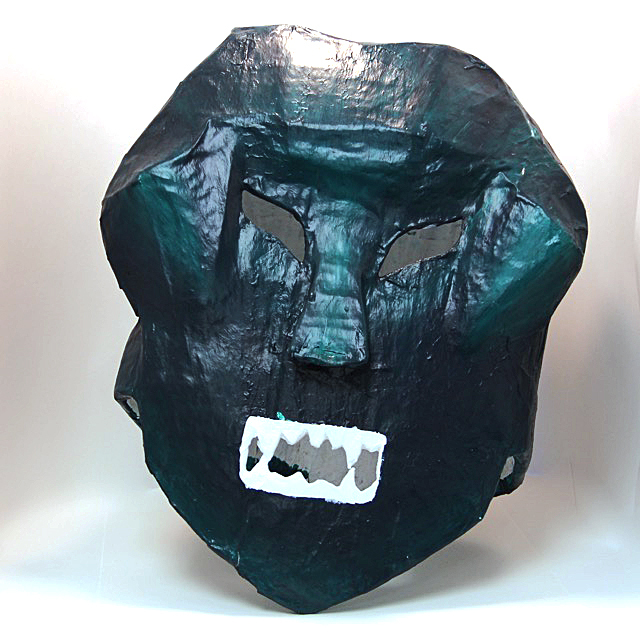 The mask gives the wearer super human strength, the ability to control the elements, and makes the wielder immortal. With the mask he only becomes a half demon, retaining some of his humanity. When the man turned demon becomes uncontrollable, horns grow atop his head and he’s able to transform into a full demon. When he becomes a full demon he’s able to call demons from hell to do his bidding. The mask chooses it’s wielder, it finds one worthy of it’s power. But, the mask consumes his humanity until there is no man left to be seen. And when the man has gone mad the mask comes off and chooses it’s next victim to drive mad with power. A chief of a tribe was sacrificed to not have the other tribal members to be murdered and ravaged upon. His name was Octavious. He had came back from the dead and had wanted to get revenge on the tribe mates who had sacrificed him. He was the One who had saved them and brought them to safety. He had got his revenge by coming back from the dead and killing his murderers. The reason he looks how he does now is because the way he was killed, was by being hit in the back of the skull. The colors on the front were the colors he had painted on his face for his tribe. He came back as a skeleton because then he could just put himself back together again. He was. My mask doesn’t really represent anything all that much. 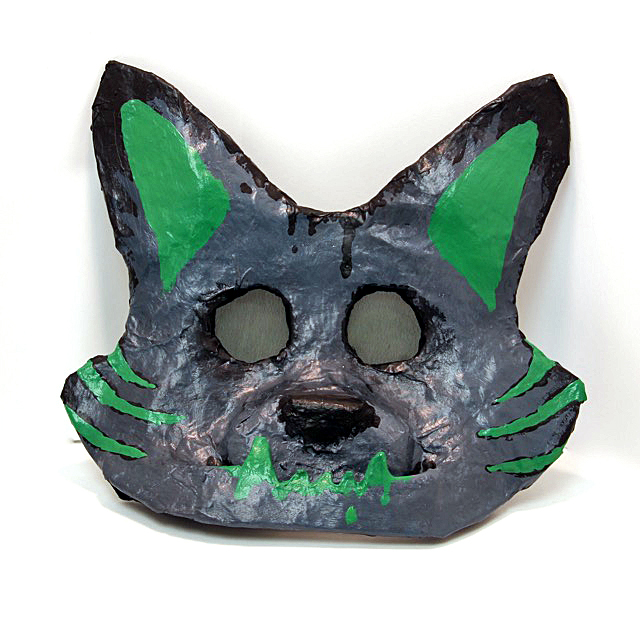 I made it look like a cat with an underbite, but gave it green markings. The green markings at not natural in actual cats, but are very noticeable on the darker blue-grey color. I made the mask so I could wear it only on my face, and have my real hair hanging over the top of the mask, the mask is held in place by the hair band and by tucking the sides of it under the sweaters hood. The eyes are not see through as I used a fabric that can only be seen through if your eyes are very close to it. There might actually be a deeper meaning behind the mask but I can’t figure out what it might be or how to put it into words. There once was a young man who kept to himself and watch the world go by. As a child he had lived a life where he was free. And he still held on to the natural memory of who he was. When he got older he realized he had to change for everybody else and didn’t have room for what he really was. Why did people bring hate he thought. He thought of a place where there would be peace and happiness for everyone. He looked at the way the connection between the natives had with the animals, and their raw spirit. So he decided to leave his home and live and roam the desert . And that’s when he created the mask that brought the spirit of the wolf and the native tribes together. This is his story. From childhood, he knew he was different. School was easy to him and he understood things others had a hard time trying to understand. He dreamt of bigger things. Things like adventure and thrill. He didn’t have many friends, because no one his age was able to understand how he was feeling, so he kept it inside. Everyone tells him to just be himself, but everytime he tried to show his true self, his “friends” and family would just put him down and he would just end up hurting them. He eventually just gave up showing people who he really is and lost himself while trying to fit in and be someone else. One day, he looked himself in the mirror and couldn’t see himself anymore, only a manikin with a broken heart and dreams. Soon, he strips himself down only to find that he has grown a deep hatred inside from all the feelings and pain he has been keeping inside himself. Those feelings and pain eats away from his mind trying to find a way out. Soon he starts to lose control and before he can realize it, he has already hurt the closest person in his life beyond repair. He couldn’t control the pain and loneliness building up inside himself anymore. He loses himself and locks himself in his room so he wouldn’t hurt anyone else. The door opened and that nice little kid who dreamed so big was no longer there.. The person who opened that door was more that just a person. He was a monster. He was a soldier who just fought a war. A war with himself. His body in cuts and bruises and his mind gone. He couldn’t keep it in anymore… He drops his mask that everyone sees and shows his true self. The soldier that has been living inside him, since the beginning. This week has been a busy one! Sara has been spending the last two days working on mind maps with Sylvia Cavanaugh and Maria Jesinski’s classes and introducing different drawing and collage techniques to incorporate visual elements. Focusing on South Asia as a unifying theme and connecting topics like Colonialism in India, the Industrial Revolution, and Henry Thoreau together, students got right to work drawing and planning their mind maps. Below are a couple different approaches with this project.